ALEXANDER CITY, Ala. (Sept. 29, 2018) – Defending champion Stewart Whitt posted an even-par 72 to take a two-shot lead into the final round of the Alabama Mid-Amateur at Willow Point. His 8-under 136 total left him two shots ahead of Alan Coshatt. Whitt had a relatively uneventful day. Starting on No. 10, he had seven pars before he made a bogey and a birdie to close his first nine. He followed with nine more pars for his even-par score. Coshatt, meanwhile, carded a 1-over 73 for a 138 total. Scott Barranco is another shot back at 5-under 139. He posted the low round of the day with a 4-under 68. The field was cut to the low 60 scores and ties for the final round. The cutline fell at 8-over 152 with 67 players advancing to Sunday. Defending champion Stewart Whitt leads the field by one shot after one round of the Alabama Mid-Amateur. His 8-under 64 at Willow Point Country Club included seven birdies and an eagle versus one bogey on his opening hole. Whitt, of Athens, Ala., also finished in the top 10 at the Birmingham National Invitational last year. He was sixth at the Spirit of America Golf Classic in Decatur, Ala., in 2014. Whitt’s eagle came on No. 18. He hit a 3-iron from 218 yards to 3 feet and made the putt. Alan Coshatt of Birmingham is one shot back. Coshatt carded seven birdies on his way to firing a 7-under 65. Jordy Hayden of Fairhope, Ala., is another shot back at 6 under after back-to-back nines of 33. A total of 21 players are under par through 18 holes with field average score of 76.5. 54 holes of gross individual stroke play. The field will be cut to the low 60 players and ties after 36 holes. 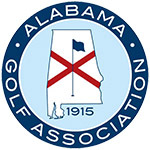 Entries are open to any male amateur golfer who is a legal resident of Alabama, has an active GHIN USGA Handicap Index at an AGA member club that does not exceed 8.4 and is 25 years of age.